/ Issues with locking/unlocking driver door with key fob. Issues with locking/unlocking driver door with key fob. 1) When pressing the "lock" button on the driver door it will not lock the driver door or any door for that matter. However, if you press "unlock" it will unlock all doors. I am then forced to manually press down the lock to lock the driver door. 2) The driver window will not roll down (electric). 3) When pressing the unlock button on the key fob, it will unlock every door except the driver door. 4) In order to "unlock" the driver door from outside, I have to take out the metal key from the fob and manually unlock the door (if I do not press the "unlock" button on the key fob before doing this, the security system will start going off once I open the door). Please help! :) Thank you! sounds to me, like there's a wiring issue in your door harness, have you been unexpectedly blowing random fuses? on that note, have you checked your fuses? it's possible something that shouldn't be has grounded itself or crossed wires somehow. #4 shows that your FOB and the computer is communicating properly, which means the problem is between the computer and the door. definitely, crack open the door, and give the wiring a look-over. i would also say to look at reprogramming the key. simple fix. What do it mean when it say key not accpected and the car want start. 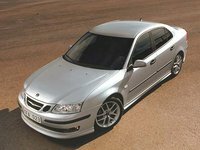 Start a new Saab 9-3 question. CarGurus has 594 nationwide 9-3 listings starting at $1,000.